Intranet software is typically used as a business tool, streamlining everyday work tasks. However, it is also a great tool for improving employee engagement and employee retention. With the addition of enterprise social networking tools, intranet software has progressed toward stronger employee communication and collaboration the last few years. The integration of more social, fun features has elevated employee appreciation and employee engagement in the workplace. 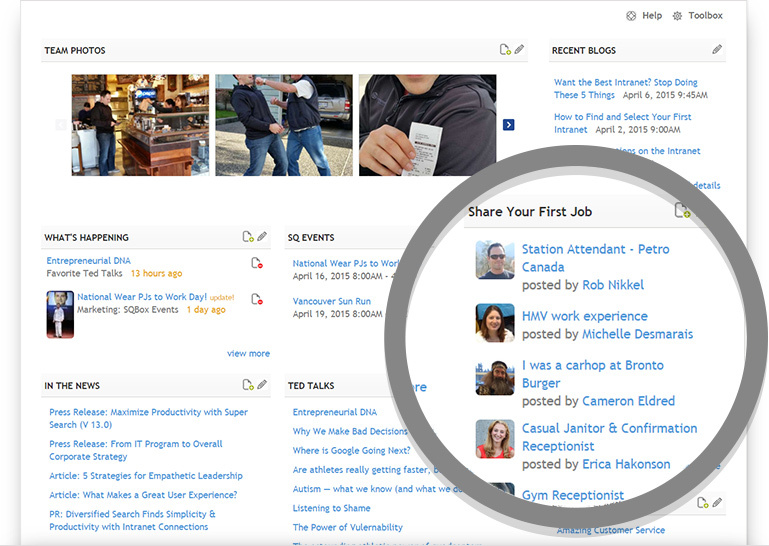 Featured Employee: Introduce new employees or share employee profiles on team sites. Employee Milestones: Recognize and appreciate employee anniversaries or employee birthdays. Employee Recognition: Foster a community of recognition by recognizing employees for jobs well done. These features are popular and heavily used by our intranet customers, but there are other applications within the intranet that can be used to appreciate and celebrate employees that are less well known, including the Share Your First Job Application. The Share Your First Job Application is simple to set-up on your intranet and highly effective in showing employee appreciation and driving employee engagement. Your users will share laughs over each others’ first jobs, prompting employees to log on to the intranet frequently to see what new jobs have been added. This is a great way to spark new conversations between employees and increase employee engagement. 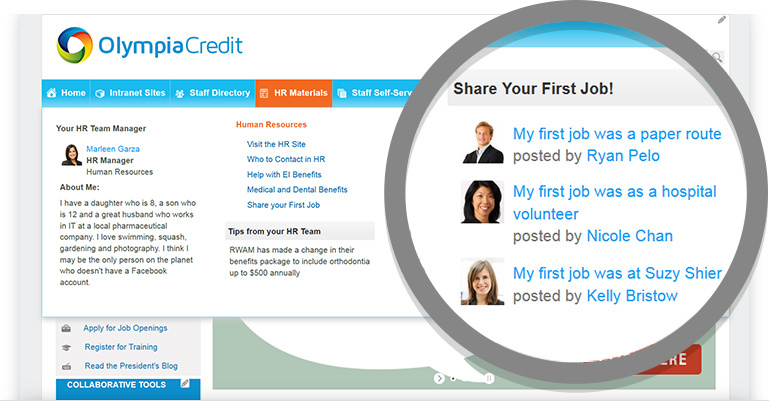 Below is a visual preview of how the Share Your First Job Application is presented on the intranet. Within the Share Your First Job Application, you can enable ratings and comments allowing your employees to “like” or comment on employees’ first jobs. If you like the idea of the Share Your First Job Application, but aren’t quite ready to include social elements such as comments and ratings, you can simply disable them. To promote employee involvement, you can push content from the application onto your intranet home page using the Application Feed Widget. This will ensure employees see the application when they login, allowing them to share their own first job as well as see what new jobs have been added without having to find where the application resides within your intranet. 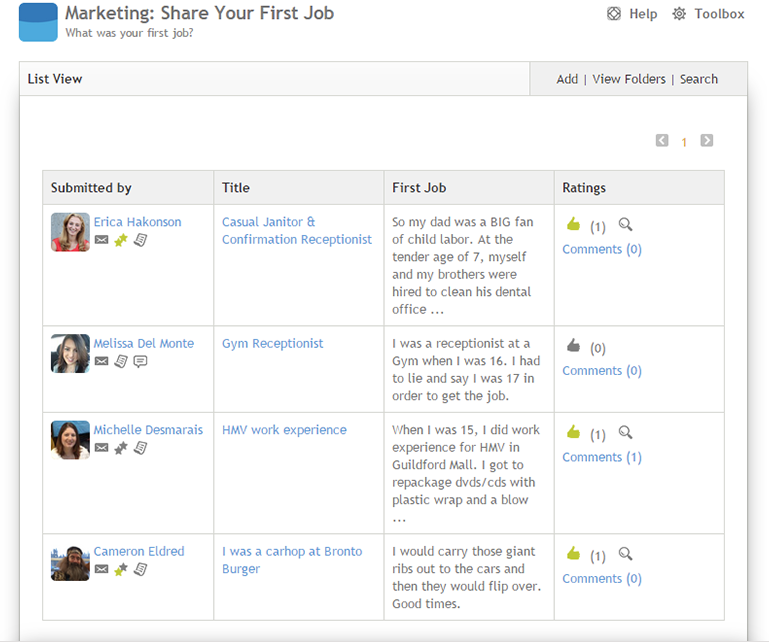 The feed of the Share Your First Job Application appears on the intranet home page as shown below. Your organization may not want to include too many social applications on your intranet home page, keeping it strictly for resource links to popular areas of the site. Adding the Share Your First Job Application to a Mega Menu instead allows employees quick access without cluttering your home page. Below is an example of what the Share Your First Job Application looks like as part of a Mega Menu. Having fun, interactive applications on your intranet is a great way to increase employee engagement and involvement. Using the “blank” application shown in the Share Your First Job video tutorial, the options of what you can add to your intranet are endless! A Share Your First Job Application is just one example of how you can create engaging applications yourself that show employee appreciation while engaging your audience. What engaging applications have you included on your intranet? Let us know by commenting below! Or share your first-hand experience with the Share Your First Job Application.